Just as the urgency for digital businesses to move faster has grown, excitement around DevOps has exploded. Yet challenges persist, as many companies realize that the seemingly simple DevOps concepts of collaboration and transparency can be quite difficult in practice. While dimensions like cultural transformation and automation are important, data is a sometimes overlooked but crucial unifying force for successful DevOps initiatives. 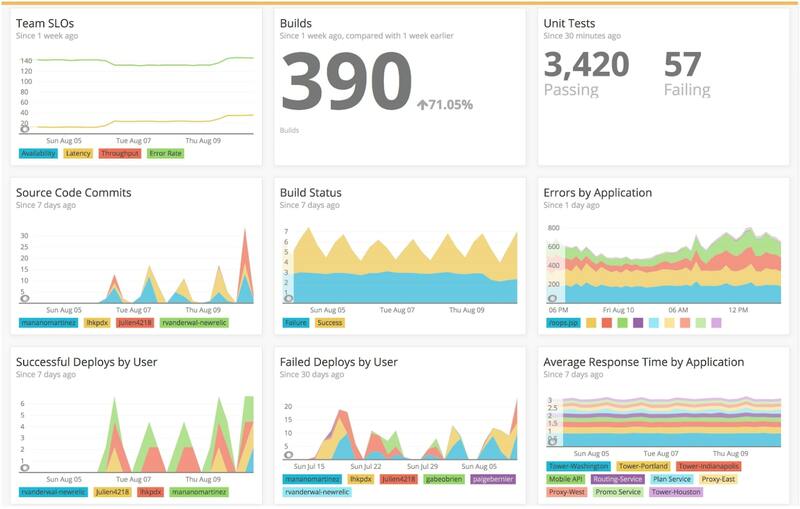 With data-driven DevOps powered by the New Relic platform, you get visibility and detailed metrics for every aspect of your digital business—applications, infrastructure, and customer experience. The New Relic platform is designed to help you get the data you need to establish clear and measurable objectives that sharpen focus across teams. Our goal is to help your organization establish a common set of KPIs, eliminate silos, and move faster confidently as a data-driven team. Prepare. Begin by measuring your current state and making sure you can see everything with instrumentation across all of your technologies. Set goals for your DevOps implementation. Activate. Use that instrumentation to monitor and quickly surface the information that will allow you to fix problems fast. Optimize. Continue to automate, and replicate your successful DevOps practices across the organization. Wherever your apps are hosted, in the cloud or on-premise, New Relic software can show you the data you need to start your DevOps journey. Get visibility into basic issues affecting customer experience and establish quick wins before setting a baseline for additional optimization efforts. Set SLOs (service level objectives), which provide a powerful mechanism to codify DevOps goals in a way that can be measured and shared. Set up alerting to be notified when performance has a negative impact on key business indicators. Well-defined alerting is critical to helping busy engineers understand system health and to drive response to performance problems before they affect customers. As your development and deployment effort picks up speed, you will be deploying a lot more changes into your environment. It is critical to create a tight feedback loop so you can see the impact of each individual deployment on the overall ecosystem and quickly find, fix, and correct problems. Build team dashboards. Use these dashboards to foster effective teamwork and action during daily stand-ups and deploys. Deploy with confidence. Understand the impact that each code deployment and infrastructure change has on the application in order to innovate faster and maintain stability. Align teams, tools, and processes around incident responses. Build a repeatable process and framework that minimizes ambiguity in accountability and responsibility around incidents. Once you have achieved DevOps success on the team level, it’s time to up your game. The next step is to enable high-performing, high-engagement teams to take action with shared data that connects people, processes, and technology performance across the company with specific business outcomes. Understand the dependencies across application teams and related services. Greater visibility into critical dependencies improves collaboration across teams to reduce outages and improve performance consistency. Drive focus with customer-centric data. Remember that your key stakeholder is your customer. Focus on how engineering efforts affect the customer’s experience and business results. Remove waste from your delivery process. Optimize usage of your infrastructure resources while maintaining application performance. Perform regular cross-functional team reviews of the current state of application service delivery compared with your SLOs. The New Relic platform helps you deliver new value to customers quickly and resolve issues affecting customers earlier and faster. See every change. 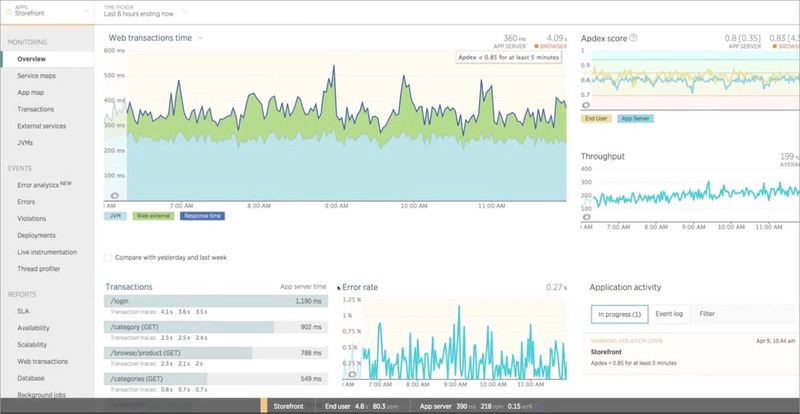 Full-stack visibility to measure real-time impact of changes in every layer of your app. Get everyone on the same page. Unified dashboards keep diverse teams aligned through shared data. Move faster with confidence. Real-time performance insight from deployments and config changes. 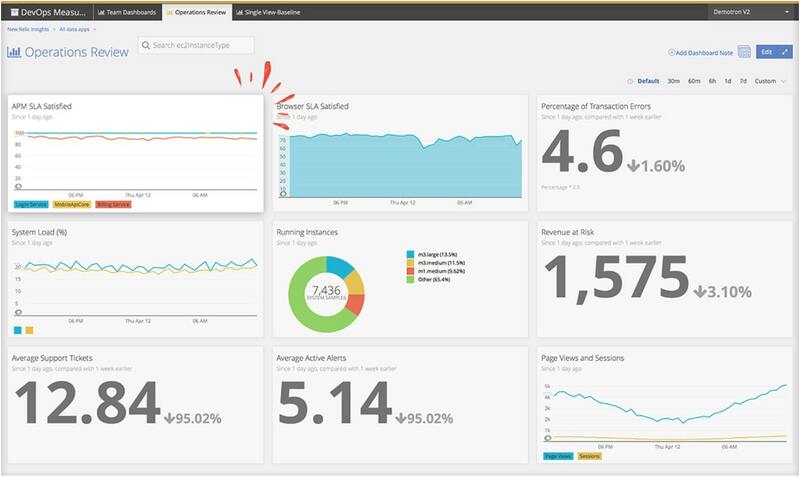 Measure what matters and see what the New Relic platform can do for you.